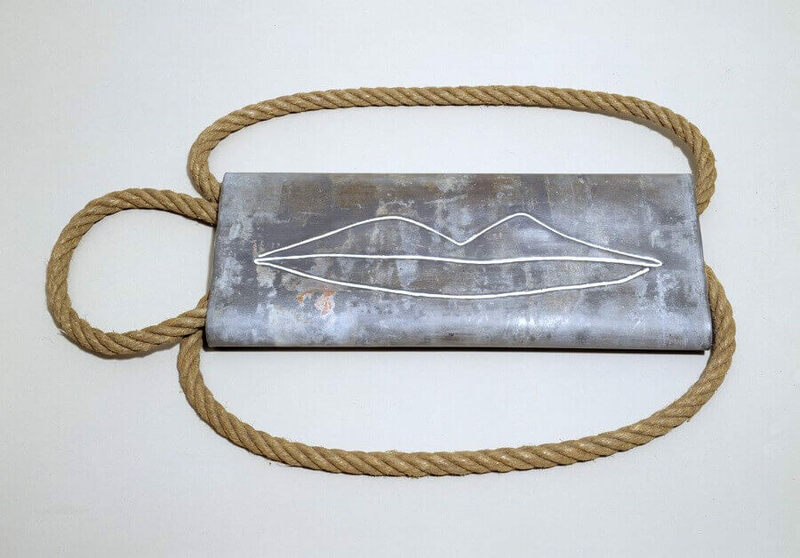 The Lovers, 1933, editioned replica 1973, consists of a rolled lead sheet with the outline of lips painted onto it. A loop of rope extends from one end, suggesting a head, while two other sections of rope, linking the two ends of the lead sheet, complete the suggestion of a body. The piece has also been known with the additional titles 'Mon Rêve/My Dream'. It is seven in the morning, before satisfying an imaginary hunger - the sun not yet decided whether to rise or to set - that your mouth comes to replace all these indecisions [...] Your mouth itself becomes two bodies, separated by a long, undulating horizon. Like the earth and the sky, like you and me ... Lips of the sun, you ceaselessly attract me, and in the instant before I wake up, when I detach myself from my body ... I meet you in the neutral light and in the void of space, and, sole reality, I kiss you with everything that is still left in me - my own lips.